the AMOC contribute to those demands. Simulations with a northern pathway bias were all forced by a wind product particularly conducive to that result and they have a strong or typical AMOC transport with a shallow bias in the southward flow. Simulations forced by the same wind product (or other wind products) that have a weak AMOC with a shallow bias in the southward limb exhibit Gulf Stream pathways with a southern bias. Data assimilation has a very positive impact on the model dynamics by increasing the strength of a previously weak AMOC and by increasing the depth range of the deep southward branch. The increased depth range of the southward branch generates more realistic abyssal currents along the continental slope. This result in combination with vortex stretching and compression generated by the data-assimilative approximation to meanders in the Gulf Stream and related eddies in the upper ocean yield a model response that simulates the Gulf Stream-relevant abyssal current features seen in historical in situ observations, including the key abyssal current near 68.5°W, a current not observed in the assimilated data set or corresponding simulations without data assimilation. In addition, the model maintains these abyssal currents in a mean of 48 14-day forecasts, but does not maintain the strength of the Gulf Stream east of the western boundary. Ocean models run with atmospheric forcing but without ocean data assimilation are useful in studies of ocean model dynamics and simulation skill. Models that give realistic simulations with accurate dynamics, when run without data assimilation, are essential for eddy-resolving ocean prediction because of the multiple roles that ocean models must play in ocean nowcasting and forecasting, including dynamical interpolation during data assimilation, representing sparsely observed subsurface ocean features from the mixed layer depth to abyssal currents, converting atmospheric forcing into ocean responses, imposing topographic and geometric constraints, performing ocean forecasts, providing boundary and initial conditions to nested regional and coastal models, and providing forecast surface temperature to coupled atmosphere and sea ice models. A wide range of ocean dynamics contribute to these different roles. Here we focus on evaluating and understanding the dynamics of mid-latitude ocean currents simulated by state-of-the-art, eddy-resolving ocean general circulation models (OGCMs), using the Gulf Stream as an example. Dynamical understanding and evaluation of current systems simulated by OGC-Ms has been a challenge because of the complexity of the models and the current systems, a topic discussed in recent reviews by Chassignet and Marshall (2008) and Hecht and Smith (2008) in relation to the Gulf Stream and North Atlantic. In some regions greater progress has been made. Tsujino et al. 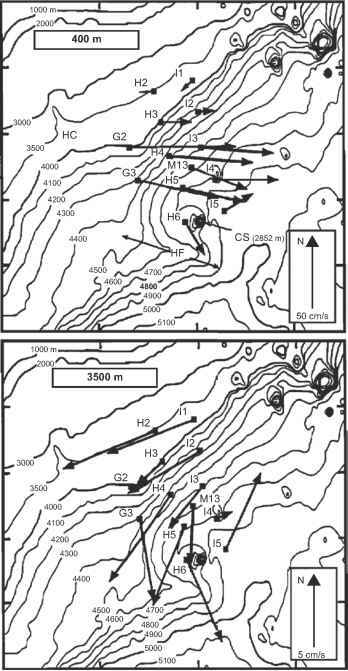 (2006) investigated the dynamics of large amplitude Kuroshio meanders south of Japan. Usui et al. (2006) used the same model to make Kuroshio forecasts from a data-assimilative initial state, typically demonstrating 40 to 60-day forecast skill south of Japan. Usui et al. (2008a, b) also used the model in dynamical studies of a 1993-2004 data-assimilative hindcast. Hurlburt et al. (2008b) examined OGCM dynamics and their relation to the underlying topography in studying mean Kuroshio meanders east of Japan and mean currents in the southern half of the Japan/East Sea. The simulations were consistent with observations and with dynamics found in purely hydrodynamic models with lower vertical resolution and vertically-compressed but otherwise realistic topography confined to the lowest layer. Consistent with observations (Gordon et al. 2002), the same Japan/East Sea OGCM simulation modeled the dynamics of intrathermocline eddy formation in that region, as discussed in Hogan and Hurlburt (2006). These are dynamics that could not be simulated by the purely hydrodynamic model. Hurlburt et al. (2008b) also investigated OGCM dynamics in simulating the Southland Current system east of South Island, New Zealand, where the topography of the Campbell Plateau and the Chatham Rise intrude well into the stratified ocean so that the design of the low vertical resolution model did not apply. In that case an alternative approach was used to investigate the dynamics. Recent observational evidence was sufficient to provide strong support for the results of the study. In dynamical evaluation of the Gulf Stream simulations by eddy-resolving global and basin-scale OGCMs, we adopt an augmented version of the approach used by Hurlburt et al. (2008b) for OGCM simulations of the Kuroshio and Japan/East Sea. Thus we build from an explanation of Gulf Stream separation from the western boundary and its pathway to the east in Hurlburt and Hogan (2008). This explanation was derived using results from a 5-layer hydrodynamic isopycnal model with vertically-compressed but otherwise realistic topography confined to the lowest layer. It was tested versus observational evidence and theory, parts of the latter contributing directly to the explanation. In Sect. 21.2 we discuss the explanation and related 5-layer model results, theory, and observational evidence. In Sect. 21.3 we evaluate Gulf Stream dynamics in eddy-resolving OGCM simulations by the HYbrid Coordinate Ocean Model (HYCOM) (Bleck 2002), the Miami Isopycnic Coordinate Ocean Model (MICOM) (Bleck and Smith 1990), the Nucleus for European Modelling of the Ocean (NEMO) (Madec 2008), as used in the French Mercator ocean prediction effort, and the Parallel Ocean Program (POP) (Smith et al. 2000). Both simulations with a realistic Gulf Stream and those with a variety of unrealistic features are assessed and specific deficiencies are identified. In Sect. 21.4 we assess the impacts of data assimilation on variables relevant to Gulf Stream dynamics that are sparsely observed, in some cases not observed at all in real time. Are realistic model dynamics maintained in data-assimilative models? Are unrealistic dynamics improved? 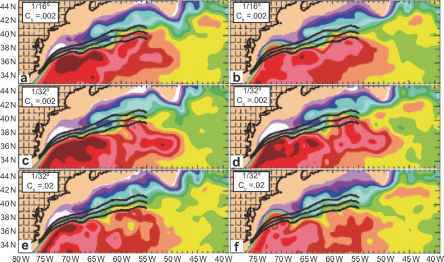 What are the impacts of dynamics on Gulf Stream forecast skill? culation (AMOC) as the nonlinear solutions discussed in Sect. 21.2. The model boundary is located at the shelf break and the resolution is comparable to that used in nonlinear solutions discussed later in this chapter. The spun up mean solution has a Sverdrup (1947) interior, Munk (1950) western boundary currents and is consistent with the Godfrey (1989) island rule, except that, unlike Munk (1950), the solution is obtained by running a numerical model with horizontal friction applied everywhere. in an ocean model. See Townsend et al. (2000) for linear solutions from 11 different wind stress climatologies. It has been a popular theory, proposed by Thompson and Schmitz (1989), that the DWBC affects Gulf Stream separation from the western boundary as it passes underneath. To investigate this hypothesis Hurlburt and Hogan (2008) used a nonlinear 5-layer hydrodynamic isopycnal model covering the same domain shown in Fig. 21.1. They also used monthly climatological wind forcing and included a 14 Sv AMOC, the latter via inflow and outflow ports in the northern and southern boundaries. 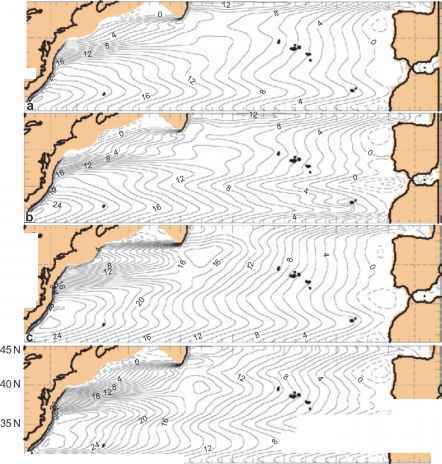 Figure 21.2 depicts the mean sea surface height (SSH) from six simulations. The northward upper ocean component of the AMOC resides in the top 4 layers and is always included, while the DWBC residing in the abyssal layer is included in the simulations in the left column of Fig. 21.2 and turned off in the simulations in the right column. Since the model is purely hydrodynamic, the DWBC can be turned off without altering the watermass characteristics. In the three rows of Fig. 21.2 the model resolution is varied in tandem with the horizontal friction and in the bottom row the bottom friction is increased 10-fold to damp the eddy-driven abyssal circulation. East of 68°W all of the simulations give similar, generally-realistic Gulf Stream pathways, except near 50°W, where the simulations with a DWBC exhibit two mean pathways (inner and outer meanders) at the location of the Gulf Stream transition to the North Atlantic Current as it rounds the southern tip of the Grand Banks, a phenomenon discussed dynamically in Hurlburt and Hogan (2008). All three of the simulations with a DWBC and one of the simulations without it exhibit a realistic mean Gulf Stream pathway west of 68°W, but the other two simulations without a DWBC exhibit pathways that overshoot the observed separation latitude in accord with the constraint of linear theory on the flow. These results indicate an abyssal current impact on the pathway west of 68°W. v - v2g is parallel to contours of h1. In (21.3) k is a unit vector in the vertical, f = 2msin6 is the Coriolis parameter, m is the Earth's rotation rate, 6 is latitude, g'=g(p2 -pt)/p2 is the reduced gravity due to buoyancy, g is the gravitational acceleration of the Earth, and pi is the water density in layer i. Since geostrophy is typically a very good approximation outside the equatorial wave guide and normally near-surface currents are much stronger than abyssal currents, then usually |vj»|v2|, making Vhj a good measure of vt under these conditions. From the preceding we see that abyssal currents can advect upper layer thickness gradients and therefore the pathways of upper ocean currents. Abyssal current advection of upper ocean current pathways is strengthened when strong abyssal currents intersect upper ocean currents at nearly right angles, but often the end result of this advection is near barotropy because the advection is reduced as vt and v2 become more nearly parallel (or antiparallel). (a) the flow is nearly geostrophically balanced, (b) the barotropic and first baroclin-ic modes are dominant, and (c) the topography does not intrude significantly into the stratified ocean. Additionally, the interpretation in terms of near-surface currents applies when |vnear sfc|>>|vabyssal|. Note the theory does not apply at low latitudes because of (a) and (b), but should be useful in large parts of the stratified ocean, even where current systems are relatively weak, as seen in the well-stratified southern half of the Japan/East Sea (Hurlburt et al. 2008b). While abyssal currents driven by any means can steer upper ocean current pathways, baroclinic or mixed barotropic-baroclinic instability is an important source of abyssal currents because baroclinic instability is very effective in transferring energy from the upper to abyssal ocean. These eddy-driven abyssal currents are constrained to follow the geostrophic contours of the topography and in turn can steer the pathways of upper ocean currents, including their mean pathways. This upper ocean—topographic coupling via flow instabilities requires that the physics of baroclinic instability be very well resolved in order to obtain sufficient downward transfer of energy. As a result, this type of coupling is a key criterion in distinguishing between eddy-resolving and eddy-permitting ocean simulations, in regions where it occurs (Hurlburt et al. 2008b). Results from this model and ocean models discussed in Sect. 21.3 indicate that the upper ocean—topographic coupling requires the first baroclinic Rossby radius of deformation be resolved by at least 6 grid intervals and even higher resolution is required for realistic eastward penetration of inertial jets. This coupling also highlights the need for eddy-resolving ocean models in ocean prediction systems and in climate prediction models, as discussed in Hurlburt et al. (2008a, 2009). 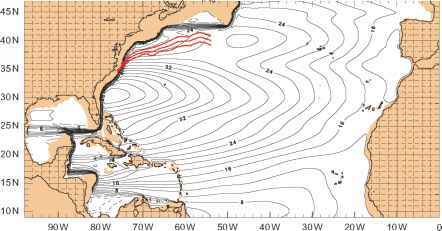 tion of a realistic Gulf Stream pathway between the western boundary and 68°W. Further, the DWBC is not necessary for simulation of a realistic Gulf Stream pathway, but it augments the key abyssal current sufficiently for that to occur in the two simulations with the weaker eddy-driven abyssal circulations. The 1/32° simulation with standard bottom friction and a DWBC (Fig. 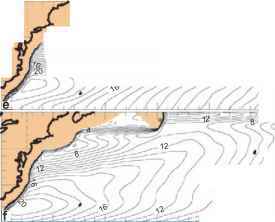 21.3c) is used in a zoom of the mean abyssal currents with the addition of topographic contours (Fig. 21.4a). The plotted contours are for the vertically-uncompressed (real) topography to facilitate comparisons between model and observed abyssal currents in relation to topographic features. 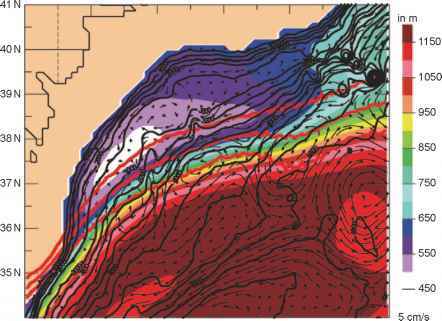 Figure 21.4b depicts mean abyssal currents and uncompressed topography from a corresponding 1/8° eddy-permitting simulation over a larger region with the zoom region in Fig. 21.4a marked with a box. It should be noted that eddy-resolving and eddy-permitting OGCMs with higher vertical resolution and thermodynamics are typically characterized by their equatorial resolution, whereas the simulations in Sect. 21.2 are characterized by mid-latitude resolution. Thus, the corresponding equatorial resolution of the simulations in Fig. 21.4a, b would be 1/24 and 1/6°, respectively. Unlike the 1/32° simulation (Fig. 21.4a), the abyssal circulation in the 1/8° model is dominated by the DWBC, which crosses under the observed location of the Gulf Stream near 72°W, and the eddy-driven abyssal circulation is extremely weak (Fig. 21.4b). In particular, the 1/8° model does not simulate the key abyssal current near 68.5°W. The DWBC augments this current in two of the simulations (Fig. 21.3a, e) because the DWBC and the eddy-driven abyssal circulation interact and become intertwined in the eddy-resolving simulations. The surface circulation in the 1/8° model is basically a wiggly version of the linear solution (Hurlburt and Hogan 2000, their Fig. 4a), who also present numerous model-data comparisons for the 1/16° simulation in Figs. 21.2a and 21.3a and the 1/32° simulation in Figs. 21.2c and 21.3c. matched closely enough to create regions of quite uniform potential vorticity for abyssal currents, as shown in Hurlburt and Hogan (2008). The shallowest and westernmost gyre is anticyclonic, while the two associated with eastward retroflections into the interior are cyclonic, all three in accord with the sign of the relative vorticity generated due to topographic constraints on the pathways of the associated abyssal currents as they cross under the Gulf Stream (shown in Hurlburt and Hogan 2008). Figure 21.5 (bottom) (from Johns et al. 1995) presents observational evidence for the key abyssal current crossing under the Gulf Stream near 68.5°W, including current speeds similar to the model, currents crossing isobaths to deeper depths beneath the Gulf Stream, and a closed cyclonic circulation. Additionally, the currents above the shallowest isobaths within the observational array flow along isobaths that would feed into the retroflecting abyssal current that crosses under the Gulf Stream near 72°W. 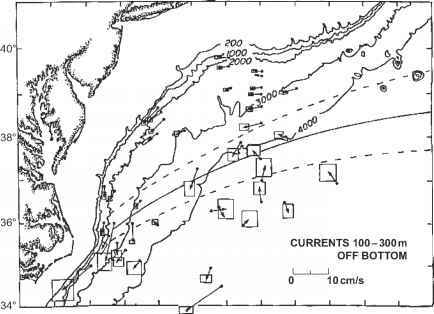 Figure 21.6 (from Pickart and Watts 1990) provides a composite of historical abyssal current measurements 100-300 m above the bottom. It provides striking evidence of the complete cyclonic abyssal gyre centered near 37°N, 71°W with current speeds similar to the model. Another salient observation is the ~12.5 cm/s west-southwestward current near 34.5°N, 71.1°W that corroborates the strong abyssal current along the gentle escarpment in Fig. 21.4a (10.5 cm/s at the same location in the model). Like the model (Fig. 21.4a), the observation-based abyssal current schematic of Schmitz and McCartney (1993, their Fig. 12a) depicts a retroflecting abyssal current pathway that later rejoins the DWBC, in addition to a pathway that continues along the continental slope. These two pathways are also consistent with Range and Fixing of Sound (RAFOS) float trajectories at 3,500 m depth discussed in Bower and Hunt (2000). RAFOS floats that crossed under the Gulf Stream west of ~71°W continued generally southward along a deeper isobath of the continental slope, while floats crossing under east of ~71°W retroflected into the interior, most of them taking complex eddying trajectories, but of the six retroflecting trajectories shown in Bower and Hunt (2000, their Fig. 7), the one that crossed under at the location of the key abyssal current (near 69°W) (their Fig. 7j) took an eddying trajectory en route to a small amplitude double retroflection, first to the east (at 36.7°N, 70.1°W) and then to the west (at 36.0°N, 68.4°W) before rapidly following a nearly straight-line trajectory along the gentle escarpment, an overall trajectory in good agreement with the model mean in Fig. 21.4a and one that provides additional evidence for the strong eddy-driven abyssal current along the gentle escarpment (seen in the southern part of Fig. 21.4a). This abyssal current (also seen in Fig. 21.6) is completely absent in the 1/8° eddy-permitting simulation (Fig. 21.4b), as are the observed cyclonic abyssal gyre centered near 37°N, 71°W (Fig. 21.6) and the abyssal current observed crossing under the Gulf Stream between 68° and 69°W (Fig. 21.5). 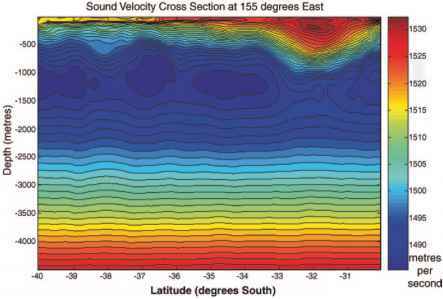 An eddy-driven abyssal current, the local topographic configuration, and a Gulf Stream feedback mechanism constrain the latitude of the Gulf Stream near 68.5°W. To help illustrate the steps explaining this statement, Fig. 21.7 depicts the mean depth of the base of the model thermocline overlaid with the same mean abyssal currents and topographic contours as Fig. 21.4a. The results are from the same 1/32° simulation with a DWBC shown in Figs. 21.2c, 21.3c, and 21.4a. pathway is halted. (5) The local latitude of the Gulf Stream is determined by the northernmost latitude where the abyssal current can become parallel to the Gulf Stream. 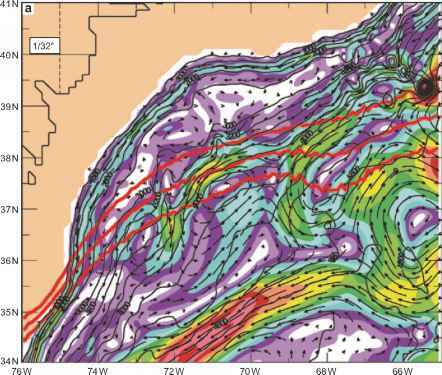 (6) Due to constraints of the local topographic configuration on this process, the resulting local Gulf Stream latitude is not very sensitive to the strength of the abyssal current, once it is sufficient to perform the advective role. However, the results of these dynamics would be sensitive to the location of abyssal currents in relation to the isobaths, the accuracy of the model in representing key topographic features, and the depth change in the base of the thermocline across the Gulf Stream. Essentially the same explanation can be applied to the effects of the abyssal current crossing under the Gulf Stream near 72°W (when present and sufficiently strong) and to abyssal currents that develop either cyclonic or anticyclonic curvature and become either parallel or antiparallel to the Gulf Stream while crossing underneath. However, the response to the abyssal current near 72°W is minimal as evidenced in Figs. 21.2 and 21.3 and an impact is visible only in the 1/32° simulation with a DWBC and standard bottom friction (Cb=0.002) (Fig. 21.2c). In Fig. 21.2c there is a straightening of the Gulf Stream pathway over ~73-70°W not seen in the other figure panels. This phenomenon is also evident in the overlaid mean Gulf Stream IR northwall frontal pathway and in the Gulf Stream pathway as depicted by the 12°C isotherm at 400 m depth, the latter shown in Watts et al. (1995). An explanation for the slight impact of this abyssal current on this Gulf Stream simulation is discussed in the next subsection. Additionally, it should be noted that the scale of the eddy-driven mean abyssal gyres beneath the Gulf Stream is similar to the width of the stream (Fig. 21.7) and related to regions of nearly uniform potential vorticity beneath the stream (Hurl-burt and Hogan 2008), where slopes of topography and the base of the thermocline are quite well matched. These gyres are not related to mean meanders in the Gulf Stream. In contrast, the Kuroshio exhibits two mean northward meanders just east of where the Kuroshio separates from the coast of Japan, meanders that are dynamically related to eddy-driven mean abyssal gyres, as discussed in Hurlburt et al. (1996, 2008b). Constraint of the Gulf Stream latitude near 68.5°W is not a sufficient explanation of the Gulf Stream pathway between the western boundary and 69°W. Further, the abyssal current crossing under the Gulf Stream near 72°W demonstrated little effect on the pathway. Thus, there must be another essential contribution to Gulf Stream pathway dynamics over that longitude range. Using along-track data from four satellite altimeters, Fig. 21.8 depicts only a narrow band of high SSH variability along the Gulf Stream west of 69°W, indicating a relatively stable pathway segment in that region. Thus, we test the relevance of a particular type of theoretical inertial jet pathway, namely a CAV trajectory (Rossby 1940; Haltiner and Martin 1957; Reid 1972; Hurlburt and Thompson 1980, 1982). In a nonlinear 1.5 layer reduced-gravity model, a CAV trajectory requires a frictionless steady free jet with the streamline at the core of the current following contours of constant SSH and layer thickness. The latter requires geo-strophic balance so that conservation of potential vorticity becomes conservation of absolute vorticity along a streamline at the core of the current. Accordingly, the simulations in Fig. 21.2 were tested to see if (a) the mean path of the current core in the top layer of the model (black line in Fig. 21.9) overlaid an SSH contour (yellow-green line in Fig. 21.9) and (b) there was a narrow band of high SSH variability along the current core between the western boundary and 69°W (plotted in color in Fig. 21.9). In order for the Gulf Stream to separate from the western boundary as a free jet following a CAV trajectory, the CAV trajectory must be initialized with a trajectory inflection (yo ^ ®) located at the separation point. Since the angle of separation (ao) is north of due east, the CAV trajectory must subsequently develop curvature that is concave toward the south. If the simulation exhibits curvature to the north after separation, then it does not separate from the western boundary as a free jet, even through it may have one or more segments downstream that follow a CAV trajectory. simulations, in line with observations of 1.6-2.1 m/s reported in Halkin and Rossby (1985), Joyce et al. (1986), Johns et al. (1995), Schmitz (1996), and Rossby et al. (2005). A model mean uc over 75-70°W was used in the CAV trajectory calculations. The angle of separation is 53±3° north of due east for the simulations with a realistic pathway and the inflection points used to initialize the CAV trajectory calculations are marked by red dots on the trajectories. Between the western boundary and ~70°W, the four simulations with a realistic Gulf Stream pathway demonstrate close agreement between the model pathway, as represented by uc, and the corresponding CAV trajectory. However, the two simulations with pathways that overshoot the latitude of the observed Gulf Stream pathway exhibit curvature to the north immediately after separation and an inflection point (red dot) located northeast of separation from the western boundary. That means they do not separate from the western boundary as a free jet, but instead indicate a strong influence from the constraints of linear dynamics (Fig. 21.1). Thus, CAV trajectory dynamics alone are not sufficient to explain the Gulf Stream pathway between the western boundary and 69°W. However, they do explain the small impact of the abyssal current crossing under the Gulf Stream near 72°W (Fig. 21.4a), because the abyssal current and the CAV trajectory give nearly the same Gulf Stream latitude at that location (Fig. 21.9c). In the simulations with a realistic Gulf Stream, the mean pathway closely follows a CAV trajectory between its separation from the western boundary and ~70°W. The CAV trajectory depends on (1) the angle of boundary current separation (with respect to latitude), as largely determined by the angle of the shelf break prior to separation, (2) the speed at the core of the current, and (3) an inflection point located where boundary current separation occurs. Neither abyssal currents nor CAV trajectories alone are sufficient to explain Gulf Stream separation from the western boundary and its pathway to the east. 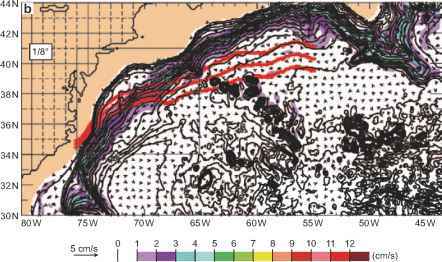 Abyssal current constraint of the Gulf Stream latitude near 68.5°W, in conjunction with the topographic configuration and a Gulf Stream feedback mechanism, is not a sufficient explanation of the Gulf Stream pathway between the western boundary and 68°W. Gulf Stream simulations with realistic speeds at the core of the current are not sufficiently inertial (a) to overcome the linear solution demand for an overshoot pathway and (b) to obtain realistic separation without assistance from the abyssal current near 68.5°W. Thus a CAV trajectory and the constraint on the latitude of the Gulf Stream near 68.5°W work together in simulation of a realistic Gulf Stream pathway between the western boundary and 68°W. The eddy-driven abyssal circulation is sufficient to obtain the key abyssal current, which was not simulated without it. 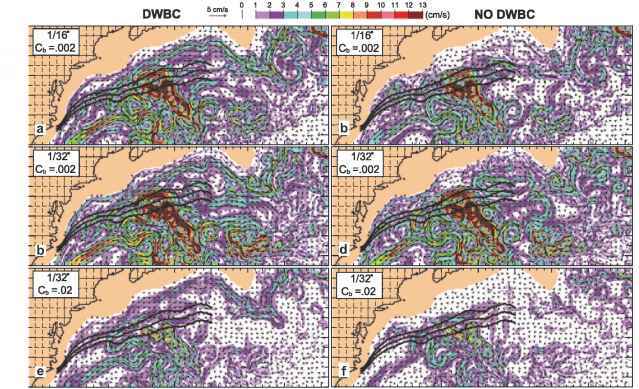 The DWBC is not necessary, but did augment the key abyssal current and did assist the eddy-driven abyssal circulation in effecting realistic Gulf Stream separation, when the latter was not strong enough by itself. The impact of the DWBC on Gulf Stream separation was resolution dependent, required at 1/16°, but not at 1/32° resolution. Finally, the dynamical explanation is robust. As long as the speed at the core of the current was consistent with observations and the key abyssal current was sufficiently strong, the simulated Gulf Stream separation and its pathway to the east were in close agreement with observations despite differences in model resolution, bottom friction, strength of the abyssal circulation, and the presence or absence of a DWBC. Further, the explanation is consistent with a wide range of key observational evidence in the upper and abyssal ocean, including a 15-year mean Gulf Stream IR northwall pathway, the speed at the core of the current near Gulf Stream separation, the pattern of sea surface height variability from satellite altimetry, and mean abyssal currents. Hurlburt and Hogan (2000) present a large number of additional model-data comparisons for the simulations depicted in Fig. 21.2a, c.
Stream region, and increased efforts to understand OGCM dynamics and dynamically evaluate their simulations in other regions. A set of eddy-resolving global and basin-scale simulations from HYCOM, MI-COM, NEMO, and POP is used in the evaluation (see Table 21.1). The resolution and model domain range from 1/10° Atlantic to 1/25° global. 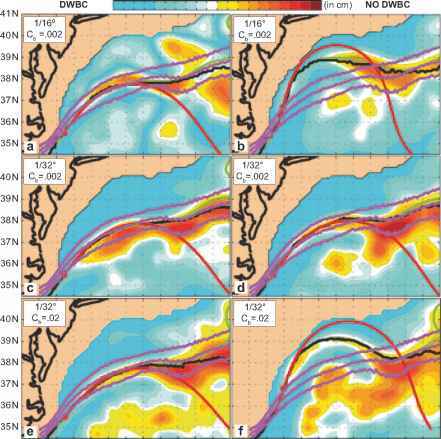 In addition to simulations with a realistic Gulf Stream pathway and dynamics consistent with observations, simulations with several types of flaws are evaluated, including (a) a realistic pathway with unrealistic dynamics, (b) overshoot pathways, (c) premature separation south of Cape Hatteras (the observed location), (d) pathways that separate at Cape Hatteras but have a pathway segment that is too far south east of the separation point, (e) pathways that bifurcate at or after separation, and (f) pathways impacted by unrealistic behavior upstream of the separation point, such as excessive variability or persistent large seaward loops east of the observed mean pathway. All four of the models used here have simulated a variety of Gulf Stream pathways, as illustrated here and in the references cited above. To streamline the evaluation for the purpose of this discussion, we focus on the following: (1) To evaluate the mean path, mean SSH from the model is overlaid by the 15-year mean Gulf Stream IR northwall pathway ±1a (standard deviation) by Cornillon and Sirkes (unpublished). This frontal pathway has 0.1° longitudinal resolution and lies along the northern edge of the Gulf Stream. (2) SSH variability is used to look for a narrow band of high variability west of 69°W and, combined with abyssal eddy kinetic energy (EKE), it is used to identify regions of baroclinic instability. Thus these fields help identify the dynamics of Gulf Stream pathway segments and source regions for eddy-driven mean abyssal currents. (3) Mean speed at the core of the current is used to assess whether or not the simulated Gulf Stream in-ertial jet is consistent with observations near the western boundary. (4) The DWBC (a term used to identify mean abyssal currents that are clearly part of the AMOC) and eddy-driven mean abyssal currents are used to assess their impact in steering the Gulf Stream pathway and related upper ocean features. Depending on their strength and location in relation to the isobaths, abyssal currents have the potential to improve or increase the errors in the simulated pathways. (5) Both the strength and depth structure of the AMOC can affect the Gulf Stream pathway. Increasing the strength can make the simulated Gulf Stream more inertial, but can also increase the tendency for an overshoot pathway based on linear dynamics. The depth structure of the AMOC influences the depths of the isobaths followed by the DWBC and interactions between the DWBC and the eddy-driven abyssal circulation. (6) The basin-wide linear solution response to the mean wind stress forcing yields the constraints of linear dynamics on the strength and pathways of wind-driven currents in the Gulf Stream region. CAV trajectories were not calculated because there is sufficient proxy information to assess this from the mean pathway, the mean core speed near separation, and the characteristic narrow band of SSH variability along the Gulf Stream west of ~69°W. 3 MICOM Miami Isopycnic Coordinate Ocean Model, isopycnal coordinates on a C-grid, NEMO Nucleus for European Modelling of the Ocean, z-levels with terrain-following coordinates in shallow water on a C-grid, POP Parallel Ocean Program, z-levels on a B-grid; HYCOM HYbrid Coordinate Ocean Model, hybrid isopycnal/pressure levels/terrain-following in shallow water on a C-grid; b Resolution for each prognostic variable; c Twin of 1/12° global HYCOM-18.0 except for the model domain and relaxation to temperature (T) and salinity (S) climatology in buffer zones within 3° of the model boundaries at 28:S and 80:N, global HYCOM experiments are from the GLBa series and all HYCOM experiments use topogrophy based on DBDB2 by D.S.K. (see http://www.7320. nrlssc.navy.mil/DBDB2_WWW); d Includes external and internal tides from 8 tidal constituents (Arbic et al. 2010); e Downward projection method for the SSH updates, i.e. Cooper and Haines (1996) or synthetic T&S profiles using the Modular Ocean Data Assimilation System (MODAS) (Fox etal. 2002). In both cases the Navy Coupled Ocean Data Assimilation (NCODA) system (Cummings 2005) was then used to assimilate all the data and other features within this region, even though a larger region may be depicted in some figures. In Sect. 21.3.1 we present the mass transport streamfunction from linear simulations forced by wind stress products used in forcing the OGCM simulations discussed later. In Sect. 21.3.2 we discuss four simulations with a realistic Gulf Stream pathway and quite realistic Gulf Stream dynamics. In the remaining subsections we discuss simulations with different types of flaws, outlined earlier, including a simulation with a realistic Gulf Stream pathway but unrealistic separation dynamics. In each case one to four examples are used to help illustrate the range of simulated results and dynamics. None of the simulations in Sect. 21.3 include ocean data assimilation. Additionally, simulations in Sects. 21.2 and 21.3.1 are characterized by mid-latitude resolution (in °), whereas OGCMs in Sects. 21.3 and 21.4 are characterized by equatorial resolution, making 1/16° resolution in Sects. 21.2 and 21.3.1 approximately the same as 1/12° resolution for OGCMs in Sects. 21.3 and 21.4, ~7 km at mid-latitudes. ECMWF products, was used (Smith et al. 2000; Bryan et al. 2007). In the latter 10 m winds were converted to surface stresses using the neutral drag coefficient of Large and Pond (1981). Note that 5 out of the 6 wind stress products are linked to ECMWF and one to NOGAPS. Although a temporal mean of the interannual wind products was used to force the linear simulations, otherwise the wind products listed above were used in forcing the simulations listed in Table 21.1: (a) 1/12° Atlantic NEMO, (b) 1/12° global NEMO, (c) all of the HYCOM simulations except as noted, (d) 1/12° global HYCOM 19.0 and 74.2, (e) 1/12° Atlantic MICOM and 1/12° global HYCOM 5.8 and 60.5, and (f) 1/10° Atlantic POP. The resulting streamfunctions are all generally similar in the Gulf Stream region and quite different from that simulated using the smoothed Hellerman and Rosenstein (1983) wind stress climatology (Fig. 21.1). They separate from the western boundary with transports ranging from 20 to 27 Sv versus 30 Sv from smoothed Hellerman-Rosenstein. In all, a large majority of the streamfunction contours separate from the western boundary north of the observed Gulf Stream separation latitude (35.5°N) and at least 50% separate between 35° and 40°N and trend east-northeastward after separation. The two wind stress products with the QuikSCAT-corrected wind speeds give the strongest transports in Fig. 21.10 ((c) 26 Sv from ERA-40/QuikSCAT and (d) 27 Sv from NOGAPS/QuikSCAT). It is significant that almost all of the streamfunction contours driven by these two products leave the western boundary north of the observed Gulf Stream separation latitude. In the case of smoothed Hellerman-Rosenstein, 17 Sv leave the western boundary north of 35.5°N, suggesting an even stronger tendency for the wind stress products used in Fig. 21.10c, d to drive an overshoot pathway in the OGCM simulations.